Because AI apps parse exponentially greater amounts of data, are extremely demanding, and require powerful parallel processing, standard CPUs cannot sufficiently execute many AI tasks. What are enterprises to do when they hit the proverbial wall with their server performance? 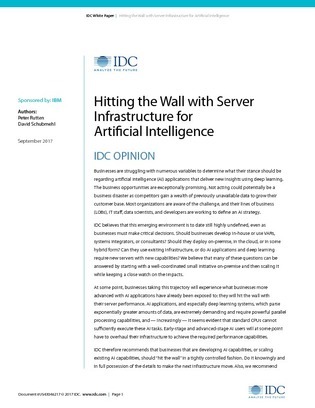 This IDC paper will help you prepare for and confront both the on-premises and cloud infrastructure limitations that AI apps create. Read on to view the advice imparted from your peers, including the importance of collaborating with a server vendor that can guide your enterprise from the early stages to advanced production to full exploitation of AI capabilities.